Hungary may have been first to literally wall off some of its frontiers, but its example has since been copied, by the French and the British. Francais. 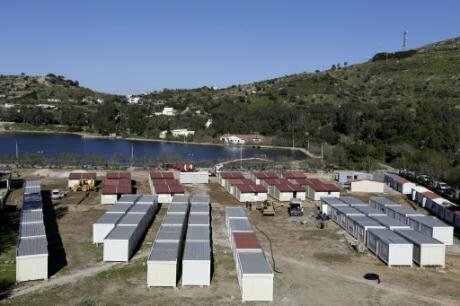 Construction workers build a refugee camp in Lepida, on the southeastern Greek island of Leros, February, 2016. Thanassis Stavrakis/Press Association. All rights reserved.Many observers see in the politics of the European member states a profound divide between the ‘old Europe’ and the so-called Visegrad group of Hungary, Poland, the Czech Republic and Slovakia. In their view, Viktor Orbàn’s xenophobic campaign against the ‘enforced relocation of non-Hungarians in Hungary’ supported by 98% of voters highlights this division, notwithstanding the small turnout (40% of registered voters) in the vote last Sunday. The reluctance of Visegrad countries to receive refugees is supposedly out of step with the EU ‘values’. Yet, despite their electioneering speeches and populist anathemas, the leaders of these states are inspired by the same dominant European principles of border control: denial of all freedom of movement for those seeking asylum, and the aim of keeping exiles at an ever-greater distance from the Schengen area, preferably in detention. Visegrad countries were not alone in protesting when, for a few weeks at the end of summer 2015, Germany and Austria opened their borders to exiles taking the ‘Balkan routes’. This welcoming policy, which broke with all European rules regarding asylum, resulted in a real panic in the heart of the EU and in various member states. Last February, the French prime minister publicly scolded the German chancellor when he said during a visit to Munich, ‘We can take no more refugees … The time has come to put into effect what has been discussed and negotiated: hotspots, controls at exterior frontiers, etc.’ Manuel Valls thus reminded us how, for more than 20 years, the EU has trampled over the founding principles of the right to asylum. It is a fact that the EU subordinates the right to asylum to frontier control, barring exiles access to asylum procedures that respect the Geneva Convention and international agreements. European rules – notably the Dublin regulation – result in concentrating exiles in ‘countries of arrival’ where their rights are not respected. Once the German frontiers had been closed once again and the chancellor had returned to positions long shared by her European partners, anathema could be pronounced against the Italians and Greeks, who were said to be incapable of ensuring the ‘security’ of the EU and of facing up to the ‘migrant influx’. Having turned the Mediterranean Sea into a vast cemetery where over 4,000 people have died since the start of 2016, European policy is transforming Greece into an archipelago of detention camps. A hotspots policy promoted by the European Commission since the spring of 2015 and progressively implemented from February 2016 was presented as the solution to the ‘migrant crisis’: despatching European officials and opening camps for the identification and triage of exiles on the Greek islands and in Italy would enable an increase in the expulsions of boat people. Recognition of Turkey as a ‘safe country’ and the agreement concluded with Recep Tayyip Erdoğan in March 2016 were in pursuit of these aims. For months the Commission had argued in favour of an increase in the number of ‘returns’ and for more cooperation agreements with ‘transit’ or ‘departure’ countries. The policy of ‘relocation’, that is, the provisional rules concerning the distribution between EU member states of asylum seekers arriving in Greece and Italy, was a deception intended to conceal the logic of hotspots. On 26 September 2016, only 5,600 people – less than 10% of the number originally envisaged – had been ‘relocated’. The same day, more than 60,000 exiles were crammed into Greek camps in conditions universally criticised as inhumane. The number of ‘relocations’ is likely to decline in coming weeks. Soon after its start, this initiative has run out of steam. In July, the UN High Commissioner for Human Rights worried that the Aegean islands had become ‘vast zones of forced confinement’. For months, European policy has been manifest in all its inhumanity. Having turned the Mediterranean Sea into a vast cemetery where over 4,000 people have died since the start of 2016, European policy is transforming Greece into an archipelago of detention camps. The situation scandalises the defenders of human rights. But it also worries many heads of state who would rather be overseeing the creation of enclosed areas outside EU borders. Revisiting UK prime minister Tony Blair’s 2003 proposal, Viktor Orbàn stated on 24 September that ‘big refugee camps should be set up outside the EU, financed and guarded by it’, to which migrants should be transported and where they should be ‘obliged to stay while their asylum applications are considered.’ His words must be taken seriously. Hungary may have been the first country in the Schengen area to literally wall off some of its frontiers, but its example has since been copied, notably by the French and the British. ‘Putting up fences for people where we would not do the same for animals, that is not respecting European values,’ intoned Laurent Fabius, then foreign minister, when Hungary set out to construct the ‘anti-migrant wall’ along its frontier with Serbia. But the promotion of a world of camps and walls is not just the project of the Hungarian leader. It is also the dominant feature of migration policy pursued by the EU and its member states for 20 years, and the consequences are now apparent. This piece was originally published in French in Liberation on October 5, 2016.